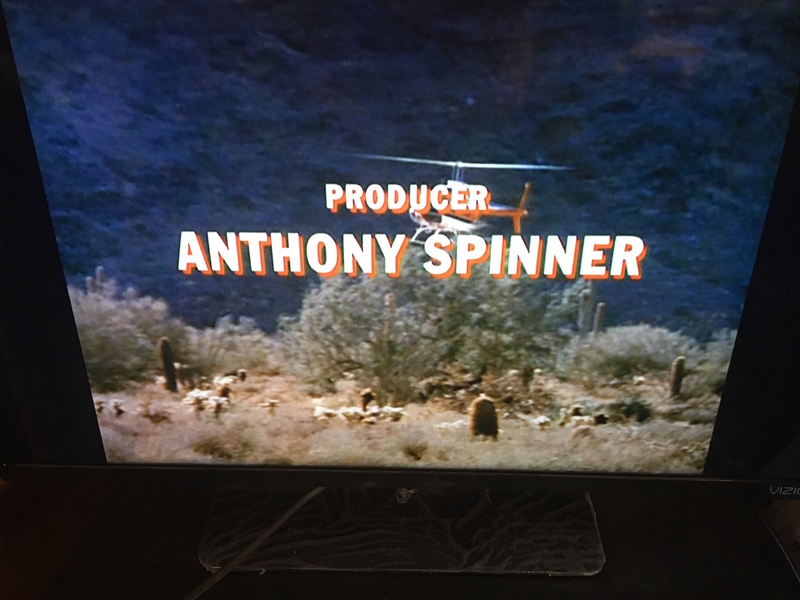 Anthony Spinner, if anything else, didn’t lack for work as a writer and producer of television series. His IMDB.COM ENTRY lists more than 20 producer credits and writer credits for more than 30 shows over decades. Quinn Martin, the head of QM Productions, had an up-and-down relationship with Spinner. But Martin often turned to Spinner. 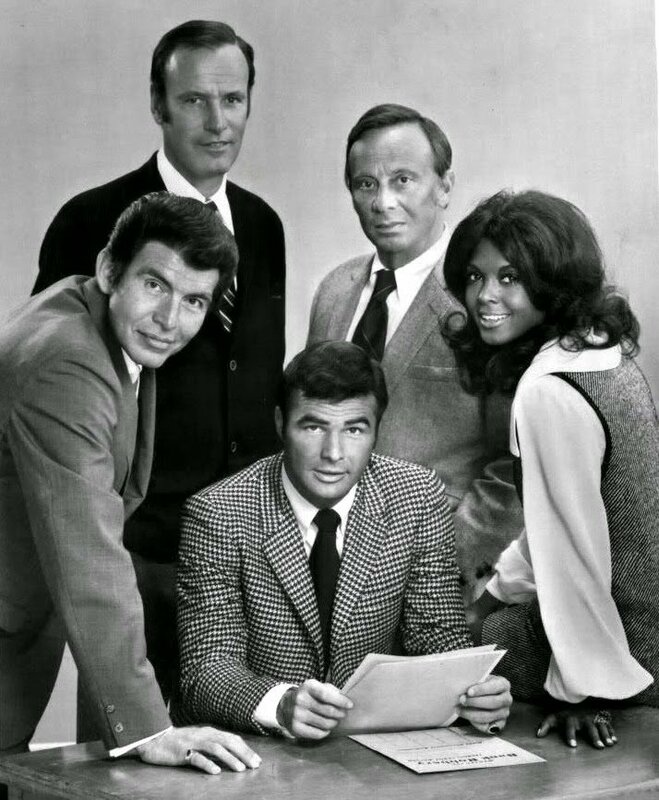 As The FBI ended a nine-year run (with Spinner its producer for the final season), Martin immediately switched Spinner to produce Cannon. 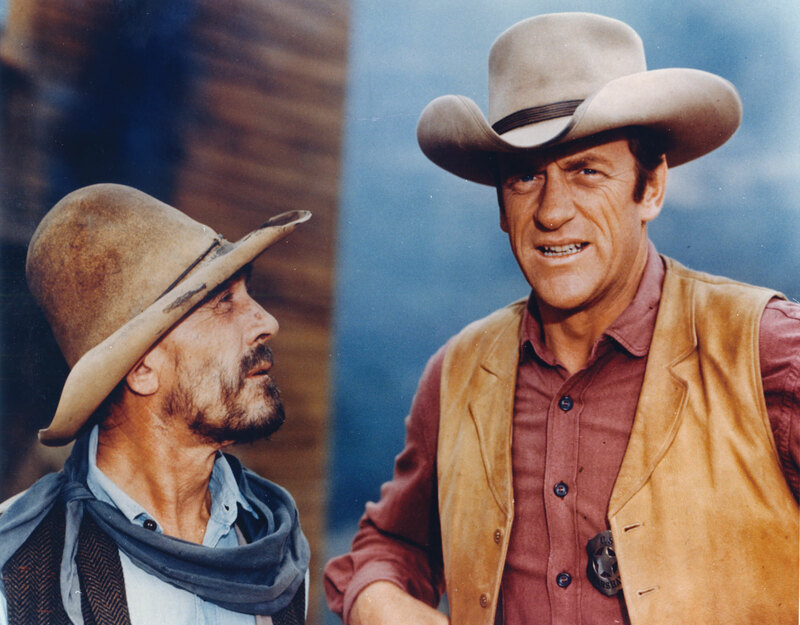 At one point in the 1970s, Martin had Spinner produce two series at the same time — Cannon and Caribe, a kind of mix of Hawaii Five-O and The Man From U.N.C.L.E. Caribe was a Miami-based police unit (Five-O) with jurisdiction throughout the Caribbean (multi-nation, similar to U.N.C.L.E.). Still, Spinner had jobs beyond QM. Most notably, he took over as producer of The Man From U.N.C.L.E. in what would be its final season (1967-68). The episodes he produced took on a much more serious tone compared with the show’s campy third season. Among U.N.C.L.E. fans, Spinner draws a mixed reaction. For some, his episodes represent a revival. For others, those episodes are too humorless compared with the show’s first season. Spinner was also story consultant and later producer of Search, a one-season series on NBC (1972-73). Search concerned a private organization, but the show had elements of spy shows of the 1960s. 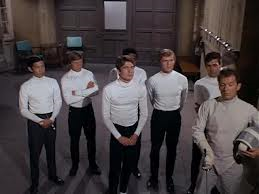 Operatives played by Hugh O’Brian, Doug McClure and Tony Franciosa took on cases while being monitored by monitored by crabby Cameron (Burgess Meredith). Spinner also was the subject of an in-joke on Mannix. Writer Stephen Kandel, who had worked for Spinner on the QM series Dan August, named a hit man after Spinner. The two would work together again on Cannon. One of their highlights: Spinner and Kandel worked together to rescue Cannon scripts during a fire at the Samuel Goldwyn Studios, according to the book Quinn Martin, Producer by Jonathan Etter. Caribe: QM tries to cross Five-O and U.N.C.L.E. 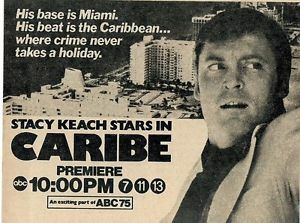 Advertisement for Caribe’s premiere in early 1975. Producer Quinn Martin enjoyed a lot of success in the 1970s with Cannon, The Streets of San Francisco and Barnaby Jones. Caribe was not a high mark, however. The veteran producer, in effect, was doing a cross of Hawaii Five-O (police drama in a tropical setting) and The Man From U.N.C.L.E. (Caribe, like U.N.C.L.E. 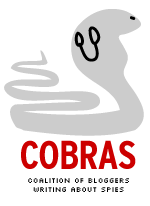 was multi-national, although Caribe’s jurisdiction only extended throughout the Carribean). Unfortunately for QM Productions (and ABC, the network which televised the show), it ran only for a half-season, from February through May of 1975. The show’s IMDB.COM ENTRY only has episode titles and no plot summaries. The Spy Commander actually watched the series regularly. I can tell you it included international intrigue (the way Five-O did on CBS). I also have a vague memory of an episode where a military coup against the United States was foiled. The problem is the show has rarely been seen since its original ABC run. The main source of information about the show is Jonathan Etter’s 2003 book Quinn Martin, Producer. Martin assigned the project to producer Anthony Spinner, who was simultaneously producing the private eye drama Cannon. 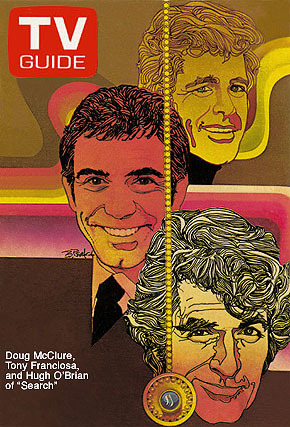 According to the Etter book, Spinner envisioned Robert Wagner in the lead. Martin sent word that Stacy Keach would be the lead instead. Rounding out the cast was future director Carl Franklin as Keach’s sidekick and Robert Mandan as the boss who sent Our Heroes on their assignments. Mandan , up until this time, was primarily a dramatic actor (including guest star appearances on other QM shows), but he’d become most famous for the (deliberately) goofy 1977-81 series Soap. Caribe was based out of Miami, similar to how Five-O was based out of Honolulu. The original plan, according to Etter’s book, was to actually film elsewhere in the Carribean but that proved logically impossible because of obtaining visas, etc. That perhaps shouldn’t have been a surprise. Thirteen years earlier, the first James Bond film, Dr. No, had a difficult shoot in Jamaica that put the movie well behind schedule. And Caribe faced tighter deadlines than Dr. No had. In any case, Miami and vicinity would double for the whole Carribean. Despite the efforts of Spinner and others, Caribe didn’t survive its only half-season. Today, it’s hard to find evidence of the show’s existence. Even a talented producer such as Quinn Martin has his off days. Meanwhile, author and television writer-producer has posted an audio copy of a Caribe main titles, including voice work by QM announcer Hank Simms. 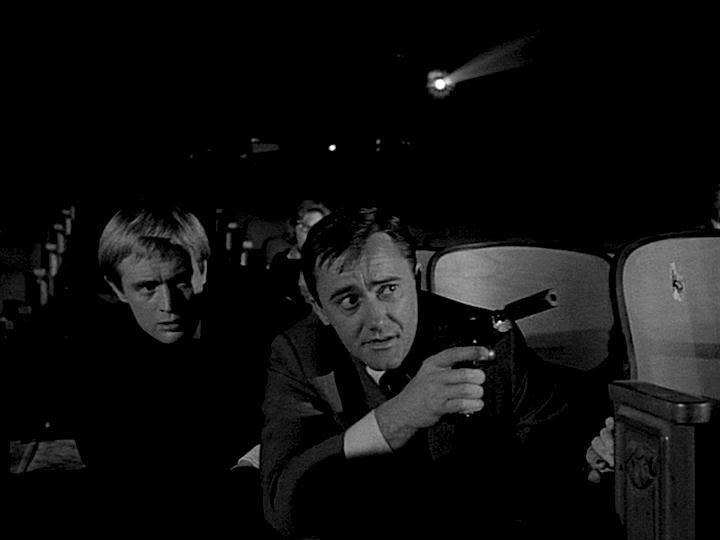 With the passing of actor Robert Vaughn, a natural reaction for fans would be to view some episodes of The Man From U.N.C.L.E. This list was originally devised last year ahead of the 2015 movie version. It was intended for people not familiar with the series. It’s still a good list of episodes to view, even for long-time fans. These aren’t necessarily the very best episodes. But the list was intended to include examples from all four seasons of the show. Stories told over two episodes are listed as a single entry here. The Quadripartite Affair/The Giuoco Piano Affair: These two episodes were filmed together but presented as separate, but related episodes. Quadripartite was the third episode broadcast. 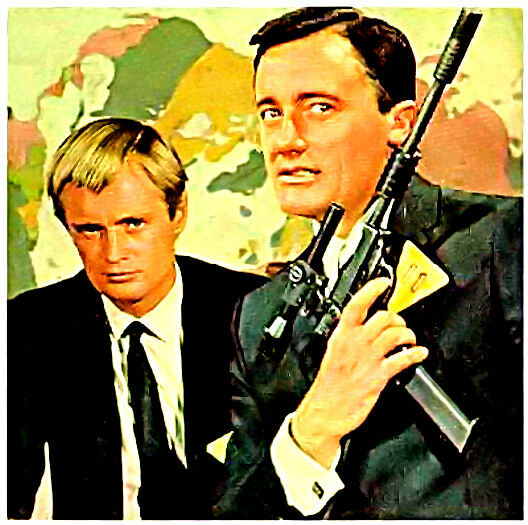 It’s also the first episode where Napoleon Solo (Robert Vaughn) and Illya Kuryakin (David McCallum) function as a team. There’s plenty of good “bits of business” for both characters. The story involves a power-hungry woman, Gervaise Ravel (Anne Francis), whose lover, Harold Bufferton (John Van Dreelan), is one of the world’s richest men and who’s more than willing to finance her plans. That’s not unlike the new film, where Elizabeth Debicki, is the lead villain. Giuoco Piano (the seventh episode broadcast) is even better than Quadripartite, showing how manipulative Solo can be. The title comes from a chess gambit that symbolizes Solo’s plan. If James Bond is the blunt instrument, this story demonstrates how Solo is the sharp operator. Both episodes were written by Alan Caillou, who did intelligence work for the British in World War II. Think an Ian Fleming, who actually went out into the field. Caillou’s two scripts helped define the Kuryakin character. 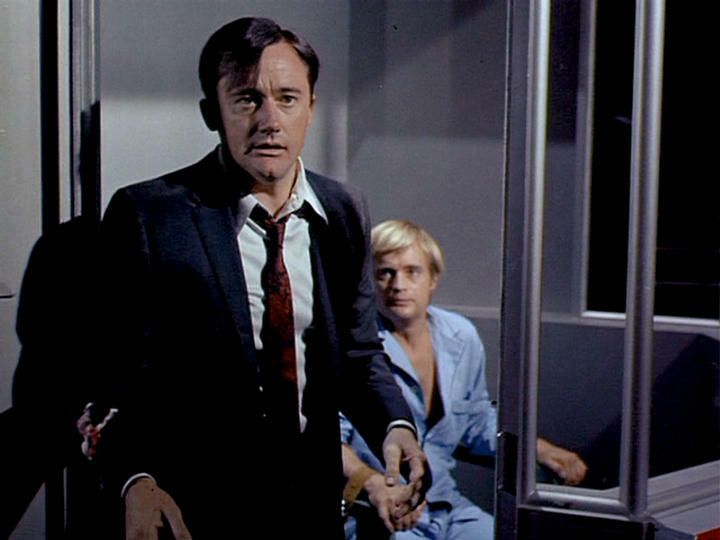 Sam Rolfe, who wrote the pilot, envisioned Kuryakin as a large, massive man. Caillou provided McCallum with the material so the actor could make Illya his own. Also, the two episodes were directed by Richard Donner, who’d become an A-list film director in the 1970s. The Never-Never Affair: Through the first season, the show tried to find the right balance of drama and humor. Never-Never, aired late in the season, became the model for future episodes. In the story, Solo feels sorry for U.N.C.L.E. translator Mandy Stevenson (Barbara Feldon), who yearns for an adventure. He sends her to get pipe tobacco for U.N.C.L.E. chief Waverly (Leo G. Carroll), while telling her she’s acting as a courier. However, she accidentally is given a valuable microdot covered by the villainous organization, Thrush. The episode includes a memorable set piece, where a Thrush assassin is firing through a movie theater screen at Solo and Kuryakin, who are having to deal with other Thrush operatives. A high percentage of the jokes work, and writer Dean Hargrove would become one of the main scribes of the series. It was the second episode of show helmed by Joseph Sargent, one of the best directors on the series. 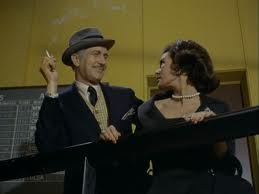 Vincent Price and Patricia Medina as rival villains in The Foxes and Hounds Affair. The Foxes and Hounds Affair: A breezy episode that aired early in the show’s second season. The new movie’s tone is supposed to be similar to the second season and Foxes and Hounds is one of the season’s better entries. U.N.C.L.E. and Thrush are both after a mind-reading machine. That’s pretty fantastic, but no more so than what can be seen in a Marvel Studios film of the 21st century. 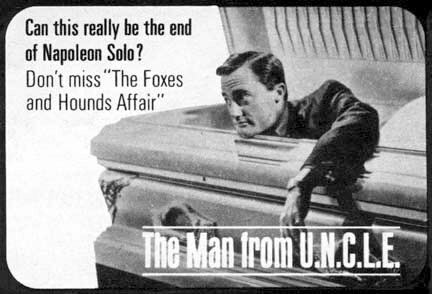 Both Solo and Kuryakin get chances to shine. We also see that Waverly is perfectly capable of being cold blooded. On top of everything else, Vincent Price is a very good villain who has to watch his back for attacks from a rival in Thrush (Patricia Medina). The Concrete Overcoat Affair: This two-part episode was edited into a movie for international audiences called The Spy in the Green Hat. Thrush has another ambitious plan that U.N.C.L.E. is trying to foil. But some retired gangsters end up becoming involved and act as a wild card. This ran during the third season, when the drama-humor balance got out of whack in favor of humor. This Joseph Sargent-directed story reins that in to an extent. There’s also a good scene early in Part II where Solo wants to go save Kuryakin but Waverly disapproves. The U.N.C.L.E. chief relents, but only reluctantly. It’s an unusual moment of drama in a season where that was in short supply. The Test Tube Killer Affair: In the fourth season, new producer Anthony Spinner wanted to dial the humor way back. This episode, early in the season, is one of the better entries produced by Spinner. Christopher Jones, center, as Greg Martin, in The Test Tube Killer Affair. Thrush’s Dr. Stoller (Paul Lukas) has been raising young men from childhood to be the perfect killing machines, able to turn their emotions on and off as needed. Stoller’s prize pupil, Greg Martin (Christopher Jones), has been chosen to blow up a dam in Greece. It’s strictly an exercise and the dam has no strategic importance but many will die if Martin succeeds. 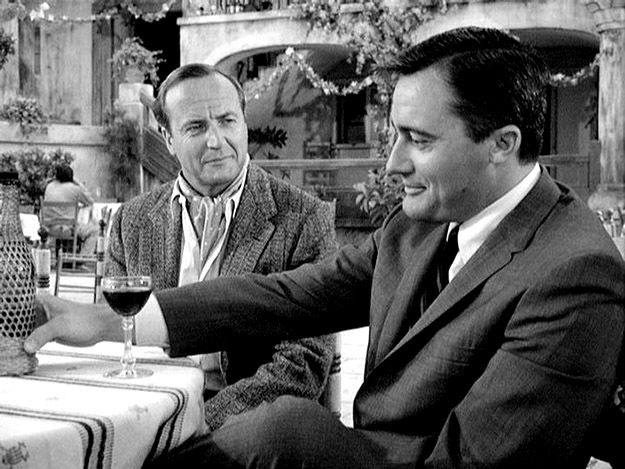 Meanwhile, the young killer is highly intelligent — intelligent enough where it appears Solo and Kuryakin may have met their match. The episode has a less-than-happy ending, something not common on the show.